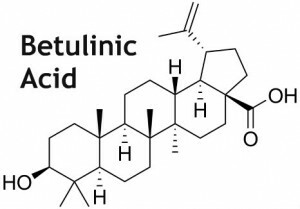 Betulinic acid is a pentacyclic triterpene sterol that naturally occurs in the chaga (Inonotus obliquus) mushroom. Chaga converts betulin from its birch tree host into betulinic acid which is more biologically active in humans and other mammals. What are the health benefits of Betulinic Acid? What is the best way to consume Betulinic Acid? Chaga contains numerous, different beneficial constituents. Making a tea (hot water extract) utilizes heat and water to extract a portion of the beneficial constituents by making them active in water. 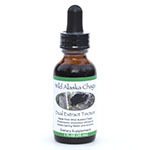 A dual extract tincture (hot water & alcohol extract) is a more thorough method of activating the health benefits of the chaga mushroom. Studies have found that certain beneficial molecules in chaga are only activated (soluble) in alcohol and will not be present in a hot water extraction. For individuals interested in harnessing the health-enhancing properties described above, betulinic acid may be the most important chaga constituent to consume. * The alcohol portion of the tincture activates betulinic acid while the hot water extraction does not.